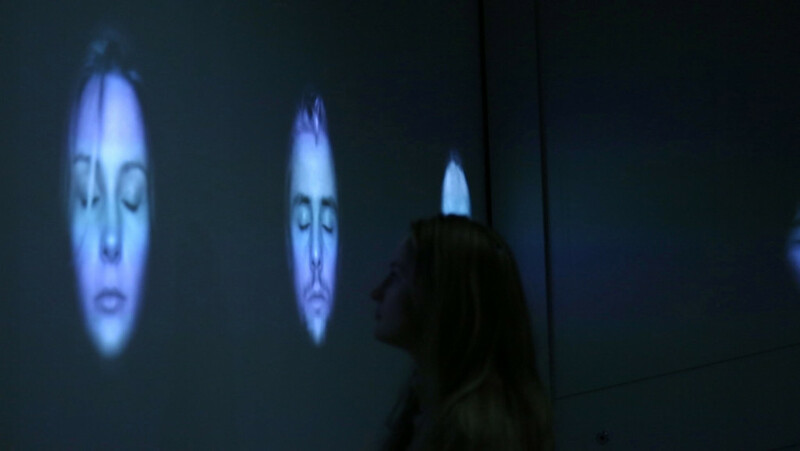 Traces is an interactive installation, where, in a room several faces are projected on the walls can be seen. Every face has its eyes closed. After a short time, when the visitor blinks, the installation detects it and takes a picture at the exact time of blinking. The picture is processed and added to the collection of faces with closed eyes. The artwork is a testimony of the visitors to the room, inhabiting it but not seeing it. In Traces, visitors become subjects of the room, objects of a spatial communication. The piece is part of an on-going series of artworks that artistically explore the social impact of technology, focusing on technologies that are explicit in their controlling intention. The presented artwork aims at reflecting on surveillance techniques as well as at exploring the poetics of digitally affecting of our relationship with physical space. Is a space changed because we have been there? Do we leave any trace on the places we have been to? The work also explores what do we actually see and experience with a specific space. Traces becomes a record of people not seeing the space where it is exhibited, a metaphorical rendering of the traces we might be leaving behind. Finally, the work is a direct commentary on the power asymmetries that every technology crystallises. Visitors of the installation are seen all the time by it, analysed, surveilled, and then shown in a moment of objective helplessness: a gentle panopticon. Traces is composed of one or more depth cameras (Kinect Sensor V2), one or several short throw projectors, and a computer. Using the depth sensors, the room is able not only to track the face in low illumination conditions but also to track the users’ eyes and detect their blinking. Traces’s software, after the interactor has being tracked for a random short interval (usually between thirty and forty-five seconds), enters into blink-detection mode. Our custom blink detector utilizes OpenCV to extract one RGB bitmap per eye and raise an event when the bitmap changes more than a certain threshold (to measure the change we binarize the images, apply a Sovel filter, and inspect the resulting blobs. Different classifiers have been implemented, with the current version using a simple neural network). When a blink is detected and the interactor is facing one of the cameras, the computer extracts a bitmap corresponding to the user’s face, desaturates it and very slightly burrs it. It is then added to the collection of faces that is projected. Depending on the projection space, a maximum amount of simultaneously projected faces is configured. When the limit is reached, a new face replaces the oldest being shown. A version of the piece using a single screen has also been developed and new configurations will continue to be explored.